Poor mental health is one of the biggest issues in the UK workplace today. But how does that affect your business, and what, in the workplace, can help with this? Presenteeism – or illness-related reductions in productivity – also adds to a huge loss in profits. In addition, a quarter of the UK workforce at any one time are considering resigning because of stress. A report from ACAS four years ago states that on average the cost to employers of replacing a single member of staff was more than £30,000. This will be far higher in 2018. Fortunately, attitudes are changing – albeit slowly – and in 2018 at Ben Johnson Interiors, we are finding the more forward-thinking companies are increasingly considering staff wellbeing as a priority within the design of their workplaces. Good employee mental health has to be priority for any business, but needs to involve more than just the HR department. Design and atmosphere of the workplace, including acoustics, lighting and temperature is crucial to employee wellbeing – as is understanding, an inclusive environment, and support rather than stigma. It’s important to get buy-in from senior leadership so this attitude is adopted by the entire workforce. People spend roughly 40 hours per week at work. So, one of the first places to start addressing this is in the design, layout and comfort of your workplace, with their wellbeing – as well as productivity, in mind. Here we’ve put together a new crucial elements of workplace design which will help – and which we advise on, source and install every day of the year. Lighting in an office greatly impacts on mood and productivity, and is far more important to staff than many employers realise – especially a good source of natural light. Try to position workstations near windows but remember distinct tasks require different types and levels of lighting. You can use lighting to define different areas of the workplace, for instance, with more subtle lighting in your breakout areas. When designing a workspace for Unilever Aladdin in Leeds, Ben Johnson Interiors first introduced roof lights at first floor level to increase the natural light and new windows were added to ensure focus areas had excellent levels of natural daylight. 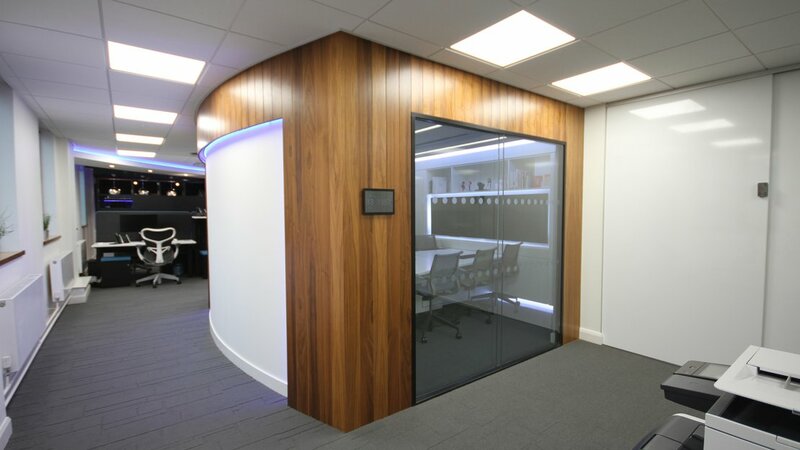 At Ashcourt Rowan financial services in Leeds, the illusion of light in the working areas was key to the design. Ben Johnson Interiors used shades of monochrome with feature lighting to increase the light in the working areas. All partitions were glazed with branded manifestation to ensure transparency throughout. It is important to give staff a choice of how and where they wish to work in an office environment. Make sure chairs, tables and stools are adjustable if possible. 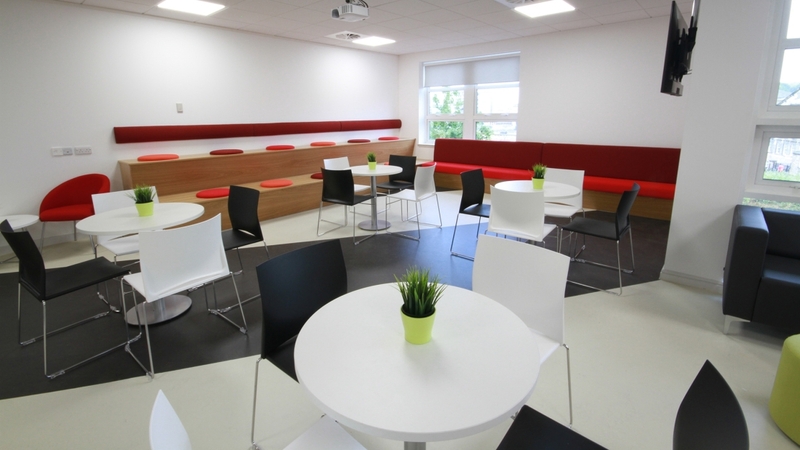 Offer a range of spaces including quiet rooms for focussed tasks or private phone calls; informal meeting rooms, breakout areas and formal meeting rooms. A variety of spaces means people move around the office more – which is good for health – and can also interact more with their colleagues. 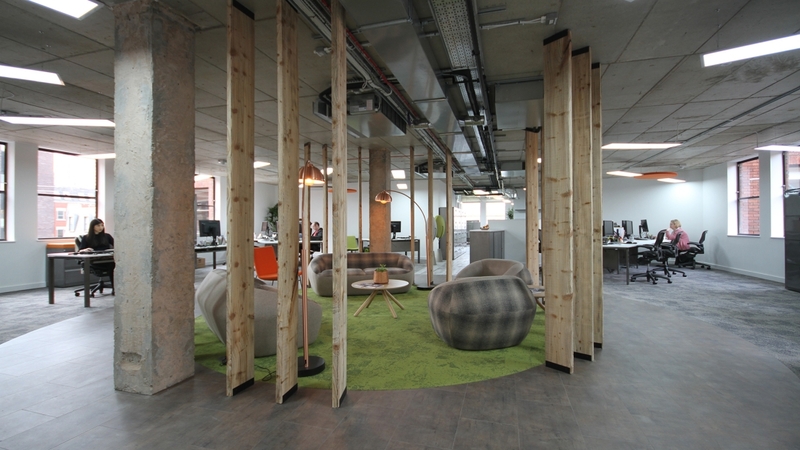 At Rank Group in Sheffield, we created a breakout area as a dynamic space separated from the main office. 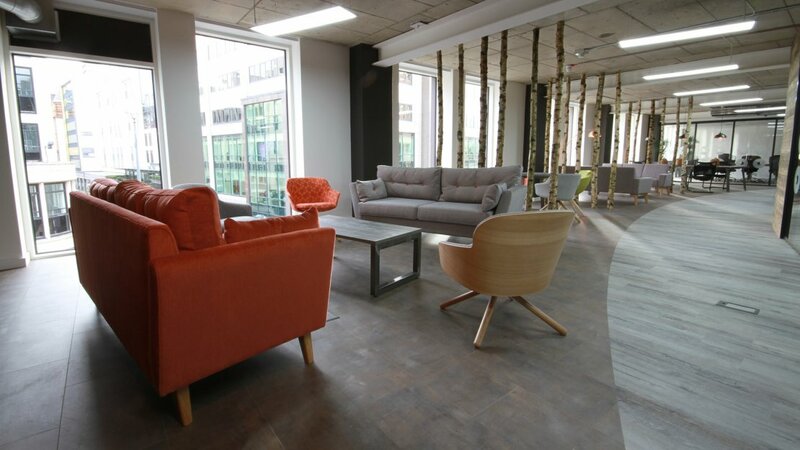 The space incorporated a variety of furniture solutions to create different zones to respond to any requirement. The zones included dining seating, informal soft seating areas and also auditorium seating. 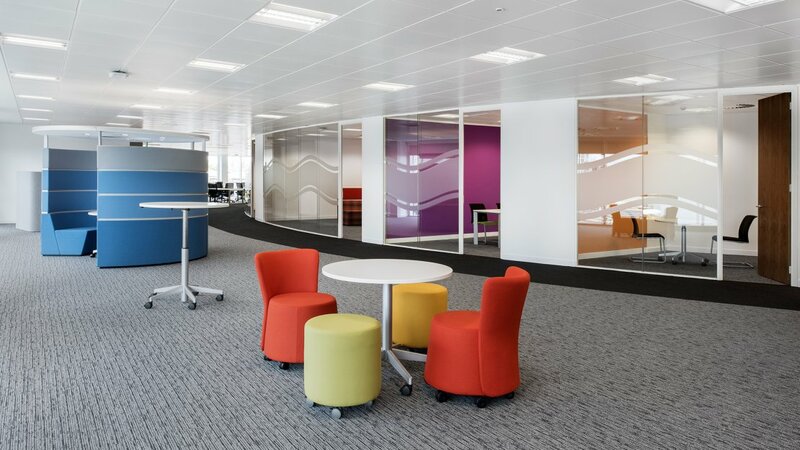 At engineering firm, Penspen Integrity in Newcastle, the scheme incorporated a mixture of meeting areas, ranging from the higher spec client boardroom and training room to the smaller internal meeting rooms and quiet rooms. The meeting provision was further increased by informal open plan furniture pods; ideal for project meetings and non-confidential discussions. The temperature in an office has a surprising impact on atmosphere and mood. It’s a tricky one to get 100% right but one tip we always give our clients in a new office design is to include the most up-to date, flexible heating and air conditioning system into the initial design from the start. As part of our interior design work for Binary Consultants, full smart building control was installed to control the climate, ventilation, lighting, blinds, audio, video and security. 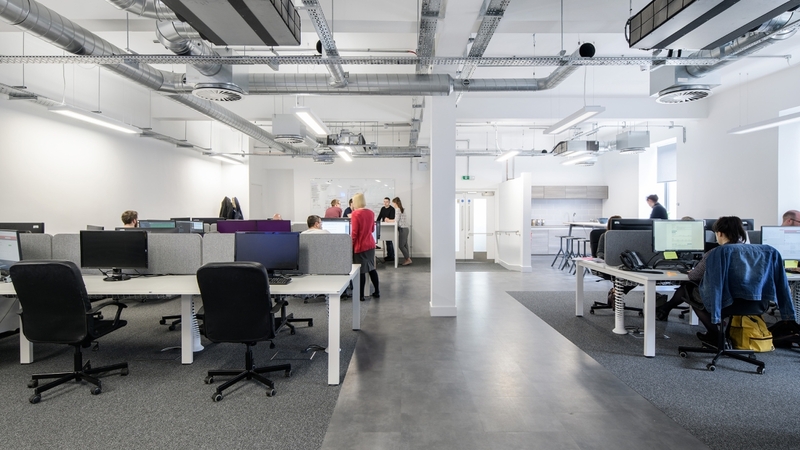 The offices respond automatically to the occupants and time of day to minimise energy usage and provide a consistently comfortable working environment. Everything can be controlled using voice commands or the 10” in-wall touch screens mounted in the office. So many different jobs go on in a workplace at any one time that it’s sometimes difficult to accommodate different acoustic needs. Some people need a quiet work area where they can concentrate, while others spend a lot of time talking loudly on the phone. In addition, many organisations encourage collaborative working and informal meetings. For people who need to work quietly this can be stressful. One solution is to install phone booths or telephone rooms for loud talkers or confidential calls. Alternatively having music playing softly in background is relaxing and welcoming and can sometimes serve to mute background chatter. Different departments can take it in turns to choose the music for the week. Another alternative is to build in acoustic considerations into the design from the start. 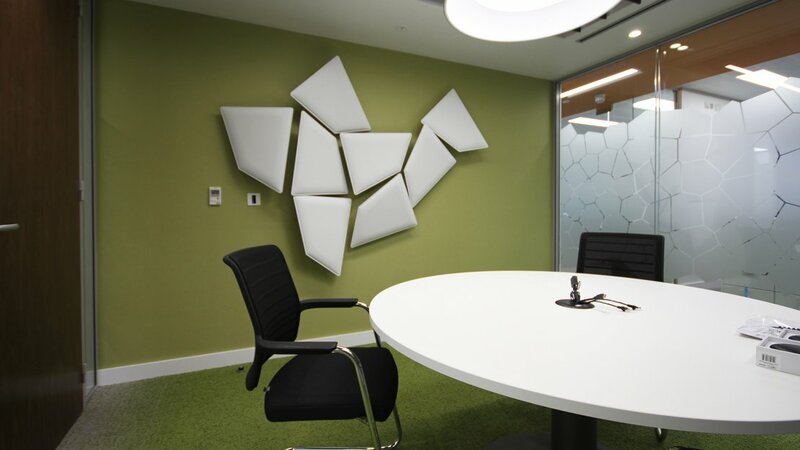 Perforated tiles, acoustic quilting, fabric-lined walls and sound block partitioning can all be used to control noise and where privacy is paramount. For Turnitin, Newcastle, we installed booth seating with inbuilt technology to double up as a quiet working space outside lunch hours. At Spectrum in Wakefield, acoustics were a particular concern for the client due to highly confidential conversations taking place on site. The design had to accommodate a larger than average amount of cellular space, including offices, meeting, training and one-to-one rooms. 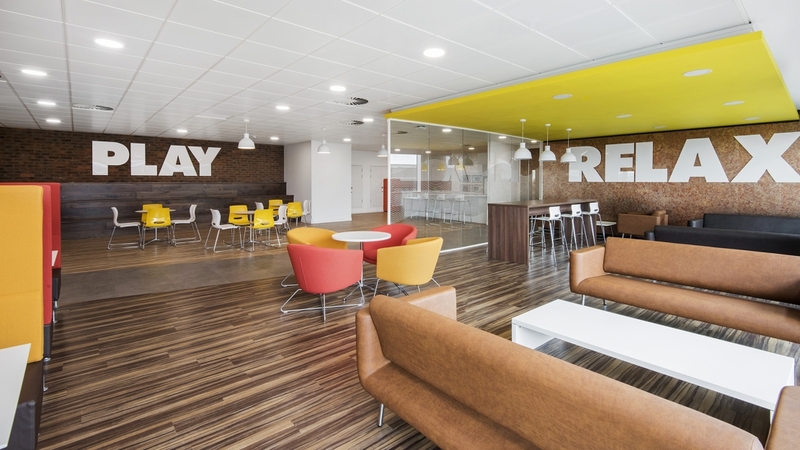 At IceLolly.com holiday company in Leeds, transparency between different zones coupled with high-level acoustic performance was achieved with the use of double-glazed partitioning and doors throughout the scheme. This offered a collaborative, transparent atmosphere, but also allowed for privacy. 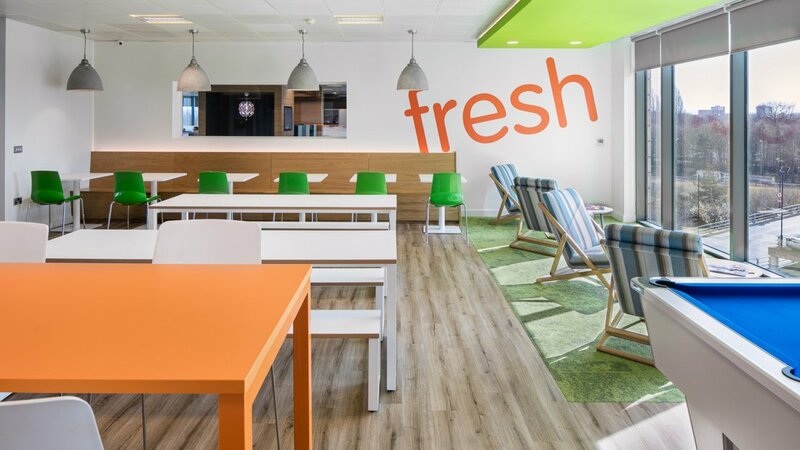 People at work need somewhere in the office where they can comfortably spend time away from their desk, enjoy a sandwich or a salad, maybe have a chat, catch up on texts or read a paper. 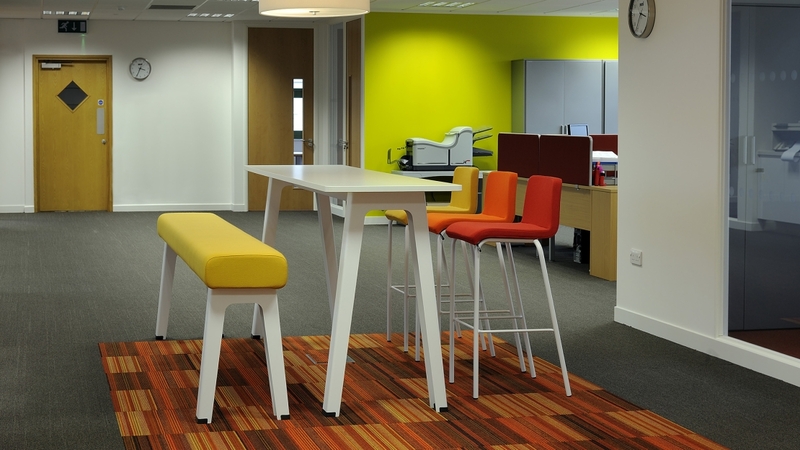 Designing good breakout areas in a workplace is becoming increasingly important. It’s also good practice to offer private as well as communal areas for those quieter members of staff who may wish to eat or relax away from others. If your kitchens are used by staff to prepare their own lunches, make sure they are big enough to accommodate large numbers of staff at any one time and ensure you have a rota system or cleaners to ensure the area is kept clean and tidy. It’s depressing to find a staff kitchen full of dirty dishes and crumbs. At Turnitin, Newcastle we were asked to give the kitchen space the ‘wow’ factor, with an L Shaped built-in breakfast bar, feature pendant lights, Corian tops and integrated handles with soft closing doors. Scientists and researchers have recorded benefits in buildings that connect people with nature, such as hospitals where patients have healed faster; schools where children are calmer, offices where employees were more productive, and communities who are happier. 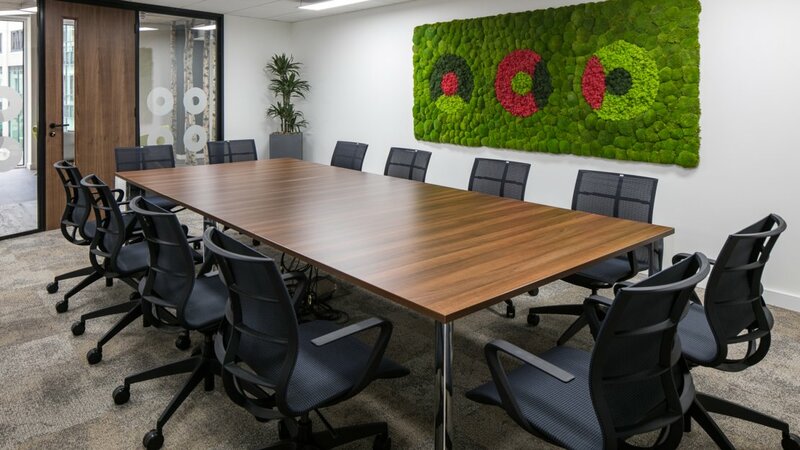 According to a report in the Human Spaces website http://humanspaces.com/report , office workers who had access to natural elements such as greenery and sunlight reported a 13% higher level of wellbeing and an 8% productivity rate than colleagues without. As specialists in 21st century workplace design, Ben Johnson Interiors are now increasingly being asked to introduce these biophilic elements into client workplaces. • Structures which replicate natural spaces. Ben Johnson Interiors designed and fitted the new Leeds East Parade corporate offices of international business assistance firm CPP Group. 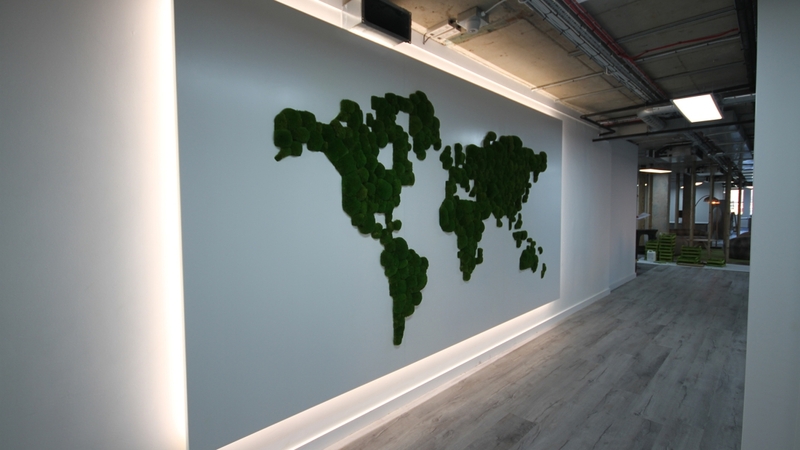 Staff and visitors enter the workplace to be greeted by a refreshment hub and “living wall” moss map of the world showing all the CPP locations. This is quirky, fun and yet also calming. There are other natural elements included in this workplace design such as real birch trees, rustic wood cladding and a central curved meeting pod. All the furniture is rustic with exposed welds to complement the interior. There’s a lot of talk about colour and its use within the workplace – with greens and blues seen as relaxing and calming, while warm colours are considered to be stimulating and creative. Ben Johnson Interiors usually likes to keep colours light wherever they’re applied. 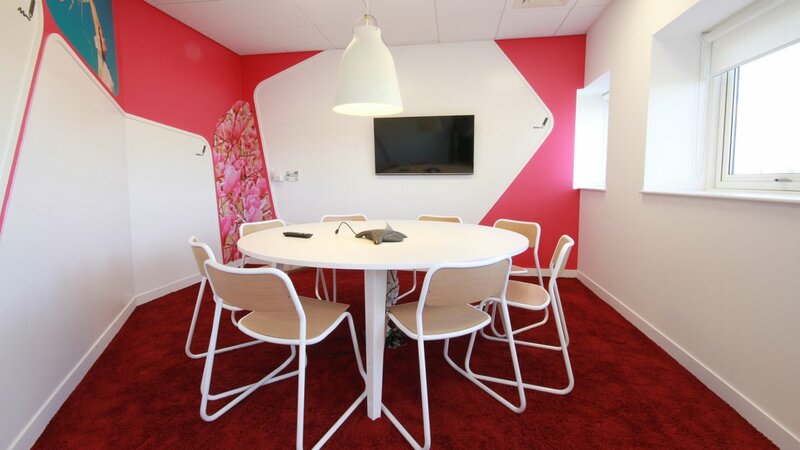 We also sometimes use colour to demarcate different areas in an office. Business type and brand will also play a big part in colour selection and it’s important to reflect your company’s values. At TP Orthodontics in Leeds we used a soft, warm, autumnal colour palette while at Horizon platforms in Wakefield we used the brand colours of black, white and grey which were accented by tones of red to create interest, while natural timbers helped to soften the space. Every workforce is different and as well as all the above considerations, care should be taken to address the needs of your particular workforce, so they feel valued. As Rank Group’s office was near Sheffield train station, they had many staff who cycled to a local train station in the morning and took their bikes on the train into Sheffield. It was also part of Rank’s business model to encourage health and well-being at work and encourage users to cycle/walk to work. The building had cycle racks, and two additional showers were installed on the Rank floor with secure lockers and a changing area. 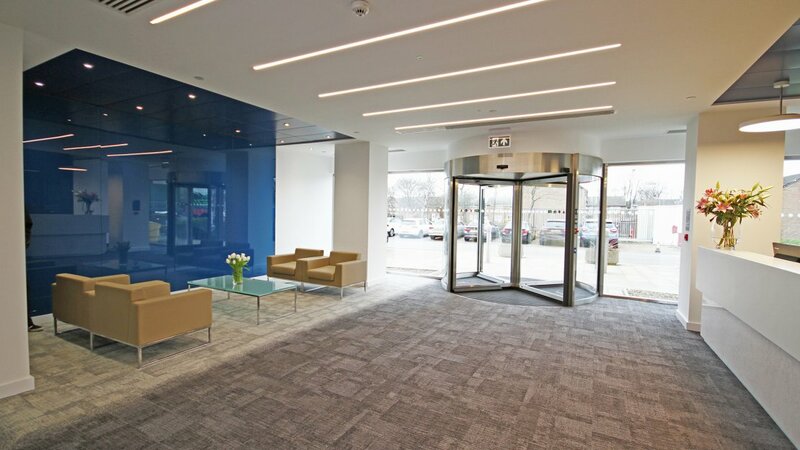 For a medical device manufacturer, we designed and installed a revolving door in the main entrance in order to create an eye catching reception area that matched their market leading reputation.